After being told there was no treatment that could save him, a Florida attorney with stage four melanoma received a new lease on life when he was accepted into a personally tailored melanoma vaccine clinical trial at the Hadassah Medical Center. 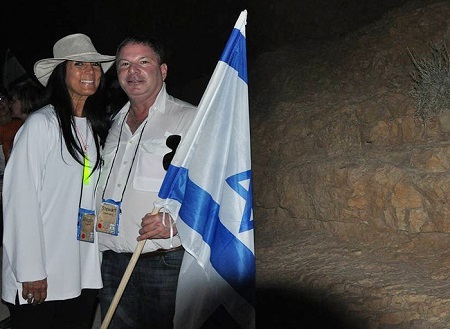 Stewart Greenberg and his wife, Maggie, had decided to go on a Miami Jewish Federation mission to Israel, together with other members of their synagogue. Shortly afterward, he was diagnosed with stage four melanoma. Facing a devastating risk of metastasis, Stewart consulted various physicians, but they were unable to offer him any strategic plan to combat this grave prognosis–including those at the United States National Institutes of Health. Hadassah Life Member Caryn Montague, who was helping him with his disability insurance, asked Stewart if he would like her to try to get him an appointment at the Hadassah Medical Center to meet with a melanoma specialist while he was in Jerusalem on the mission. Stewart received an appointment with Dr. Michal Lotem, head of the Center for Melanoma and Cancer Immunotherapy at Hadassah’s Sharett Institute of Oncology. The treatment process involves taking tissue from the melanoma patient or as in Stewart’s case, matching the patient’s tissue type and using donors’ melanoma lines to create more cells, which are then irradiated and injected into the patient. The cells work like a vaccine, triggering the patient’s immune system. Stewart’s treatment involved 21 injections of the vaccine over a 90-day period. “Hadassah is an incredible place,” he says–“caring, sweet, loving, with such respect for the patients.” During that time, he relates, he not only received terrific care, but he and Maggie also made great friends, were invited to celebrate many family occasions with those they met, as well as being given the opportunity to attend a swearing-in ceremony for Israeli paratroopers. As an attorney who specializes in medical malpractice, Stewart has interacted with many doctors. “Never,” he says, “have I met doctors like Prof. Lotem.” At midnight, he relates, she was answering his e-mails. While he was at the hospital, he witnessed her taking calls from all around the world regarding patients she has treated. Dr. Lotem is now looking toward additional research on a “second-generation” melanoma vaccine. “When people think of Israel,” Stewart notes, “they think of sand and soldiers; camels and war. I would like them to know about the biomedical achievements and how Israel contributes to the health of our world.” He brings out, too, that relations between Israel and countries where there is no relationship are built because people from those countries receive quality care at Hadassah. Before his illness, Stewart knew little about Hadassah and was unaware of the breadth of its impact. He has shared his story with the members of several Hadassah chapters in Florida and does so with great enthusiasm.